The dominant source of dissolved Ca and Mg during silicate weathering is Ca contained in plagioclase (Mackenzie and Garrels, 1966; Garrels, 1967), Mg in ferromagnesian minerals such as pyroxenes, amphiboles, and biotite, and both Ca and Mg in volcanic glass. Field studies of the rate of weathering of small areas of relatively uniform rock type, subject to similar climates and relief (Meybeck, 1987; Taylor and Lasaga, 1999), have shown that basalts weather faster then granites or other acidic igneous and metamorphic rocks. This is mainly because of the presence of highly calcic plagioclase, pyroxenes, and volcanic glass in basalts, which dissolve more rapidly than the characteristic weatherable minerals of granites and gneisses, sodic/calcic plagioclase, potassic feldspars, and micas (Goldich, 1938). As pointed out in the Introduction, the weathering of Ca and Mg silicate minerals is of primary interest in the long-term carbon cycle because the released Ca and Mg ions eventually are precipitated as carbonates in the oceans, whereas Na and K do not form carbonates. Thus, basalt weathering is an important factor in controlling atmospheric CO2. Gaillardet et al. (1999) and Dessert et al. 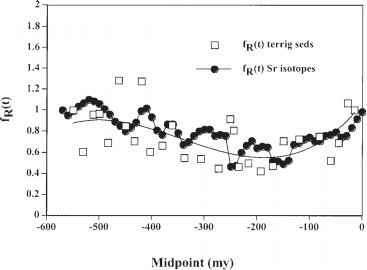 (2003) estimate that at present 25-35% of total CO2 uptake by silicate weathering is accounted for by basalt weathering. In addition, episodes of intense basaltic volcanism in the past could have resulted in net atmospheric CO2 removal, rather than CO2 addition, as normally thought (Dessert et al., 2003). This is because the consumption of CO2 by the subsequent weathering of the basaltic minerals can be greater than the amount of CO2 degassing accompanying the original extrusion of the basalt. Wallmann (2001) has emphasized the importance of subaerial basalt weathering at subducting plate boundaries. There is a great degree of volcanism there, and one can assume that the degree of eruption varies in tandem with rates of subduction over geologic time. From estimates of present-day subduction-zone volcanism, the assumption that basalt weathering constitutes 25% of total CO2 uptake by silicate weathering (Gaillardet et al., 1999), and estimates of changes over time in rates of seafloor spreading, Wallman calculated that there is an overall enhanced uptake of CO2 by adding this process to a long-term carbon cycle model. A similar result, but of lesser magnitude, was obtained by performing the same calculation with the GEOCARB model (Berner and Kothavala, 2001). Because calcite dissolves so much faster than any silicate mineral (White et al., 1999) and because traces of it are common in crystalline silicate rocks, such as veins and interlayers in metamorphic rocks (Ague, 2002) and inclusions in granite (White et al., 1999), chemical analyses of waters draining crystalline rocks can lead to erroneous conclusions about the source of solutes. Weathering in silicate terrains can produce riverine water chemistry dominated by calcite and dolomite dissolution. This is especially true of high mountain areas, such as the Himalayas and the New Zealand Alps, where rapid erosion constantly exposes fresh traces of calcite to dissolution (Blum et al., 1998; Jacobson et al., 2001). Failure to correct for the calcite source of dissolved Ca in rivers draining silicate terrains has led to erroneous reasoning as to factors affecting global chemical weathering (e.g., Raymo, 1991; Huh et al., 1998).